Some say the love the game. I marvel at players like Ryan Tatusko. A major league organization sells your contract to another league in another country? 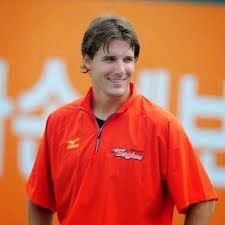 No problem for newly-married former Texas Rangers and Washington Nationals prospect who wound up 2014 pitching for the Hanwha Eagles in Korea. Some collectors seeking signatures on Tatusko’s 2011 cards who blinked may have puzzled at how to find the hurler. Just look on social media. Facebook. Twitter. He never forgot his fans. Do baseball fans in Korea crave TTM autographs as much as we do? I don’t know how many games Tatusko could win for a 2015 team. However, I can’t imagine any other pitcher, this side of Pat Neshek, winning more fans than “Tusk” could.